James Arnold Taylor and Matt Lanter are reprising their roles as Obi-Wan Kenobi and Anakin Skywalker. Attention, Clone Wars fans – some very familiar voices are returning to Star Wars™ Battlefront™ II! Below, we’re revealing who’s portraying General Grievous, Obi-Wan Kenobi, Count Dooku, and Anakin Skywalker, as our new Clone Wars heroes and villains join the game, starting this month. Plus, look out for full interviews with all of them around the releases of their respective characters, here on the official Star Wars Battlefront II website. Matthew Wood voiced General Grievous’ original appearance in Star Wars™: Episode III – Revenge of the Sith™ and The Clone Wars animated series. He also did the creative post-processing of his character’s voice. Matthew has been working with Lucasfilm since the age of 17 and is (when he’s not voice acting) Supervising Sound Editor at Skywalker Sound, the sound division of Lucasfilm. Now, he’s reprising his role as Grievous in Star Wars Battlefront II. Corey Burton has done a wide variety of work in his long voice acting career. He played Count Dooku in the Clone Wars television animated series, capturing the aristocratic and arrogant Sith Lord as originally delivered by Christopher Lee in Star Wars™: Episode II – Attack of the Clones™. Stepping into the role again is a pleasure for Corey. Remember to keep an eye on this space for full coverage of Star Wars Battlefront II, and sign up today to receive the latest Star Wars Battlefront II news, updates, behind-the-scenes content, exclusive offers, and more (including other EA news, products, events, and promotions) by email. 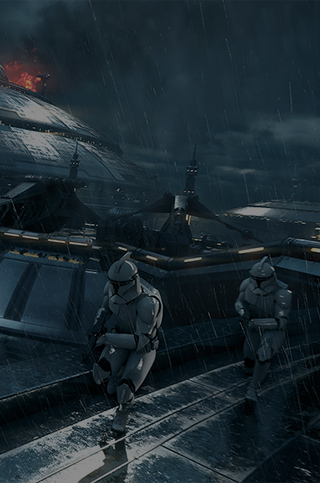 Also, be sure to follow EA Star Wars on Twitter, Facebook, and Instagram, or join the discussion on the official forums.